PURCHASE, N.Y., April 4, 2018 /PRNewswire/ -- Hey, DEW® Nation. We know you love a good April Fools' Day prank as much as we do. While The Baja Bungalow may not be real, your demand for the return of MTN DEW® BAJA BLAST® absolutely is. We've seen it. We've heard you. And now, Summer's Most Wanted is officially back on shelves, just in time for summer 2018. The tropical lime-flavored beverage known as MTN DEW BAJA BLAST will be re-released in bottles and cans, for a limited time only, beginning April 23 — the first time in two years the fan favorite will be available on shelves across the nation. In the years that it has been away, fans have taken to social media to express the lengths they would go to bring back their favorite DEW flavor. 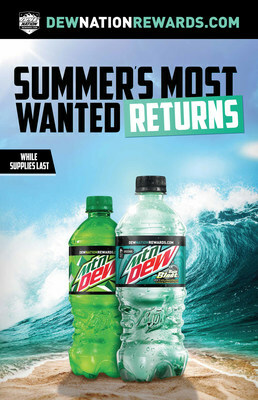 "Summer's Most Wanted flavor is back, and it's all thanks to the tireless efforts of DEW Nation," said Chauncey Hamlett, Senior Director, Marketing, MTN DEW. "We were overwhelmed by all of the love we saw on social media and other channels, so we worked hard to bring back MTN DEW BAJA BLAST. We're always listening to DEW Nation and we're excited to give them exactly what they've been craving." To celebrate, MTN DEW is giving fans who showed their love for MTN DEW BAJA BLAST by using the hashtag #BringBajaBlastBack on social media, the opportunity to appear in a video series on the brand's social channels. Those selected will bring to life the bold lengths they would go to bring the beverage back. 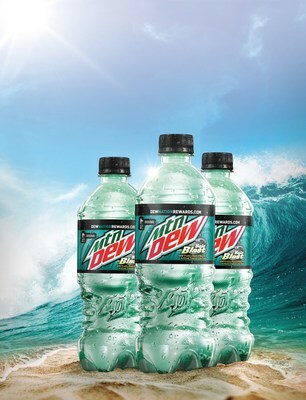 Fans will also have a chance to earn points toward MTN DEW BAJA BLAST gear and prizes through DEWNationRewards.com. Race car driver Chase Elliott will be joining the fun by driving in a special MTN DEW BAJA BLAST paint scheme at Bristol Motor Speedway on April 15. 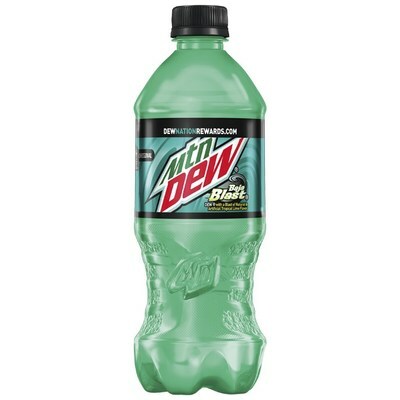 MTN DEW BAJA BLAST will be available at retail stores nationwide in 20 oz. bottles, 12-packs of 12 oz. cans, as well as additional multi-pack sizes. But like all good things, you can't ride the wave forever. So stock up on Summer's Most Wanted while you still can. Visit MountainDew.com or Facebook.com/MountainDew to stay up to date on the latest, and join the conversation at @mountaindew. MOUNTAIN DEW®, a product of PepsiCo North America Beverages, is the No. 1 flavored carbonated soft drink in the U.S. With its one-of-a-kind citrus taste, MOUNTAIN DEW exhilarates and quenches with every sip. In addition to the original MOUNTAIN DEW® and DIET MOUNTAIN DEW®, the permanent DEW® product line includes MTN DEW ICE™, MTN DEW® KICKSTART™, MOUNTAIN DEW CODE RED®, MOUNTAIN DEW PITCH BLACK®, MOUNTAIN DEW VOLTAGE®, MOUNTAIN DEW WHITE OUT® and MTN DEW® Label Series. For more information, check out www.mountaindew.com, www.facebook.com/mountaindew or follow on Twitter @mountaindew.